The New York Yankees honored their star center fielder Bernie Williams on Sunday evening at Yankee Stadium with a special ceremony to retire his number 51 and put him among the legends in Monument Park. The festivities included Williams accepting this lavish praise alongside his long standing teammates Andy Pettitte, Derek Jeter, Jorge Posada, and Mariano Rivera from his four World Series victories with the Yankees. 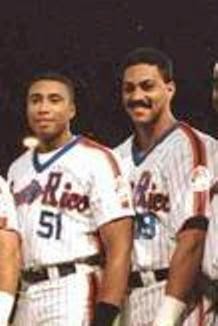 If Williams' parent club was willing to spend just a few extra dollars when they brought him to the United States to sign his contract some thirty years ago, that group could have easily included two-time American League MVP Juan Gonzalez. Yankees scout Fred Ferreira was one of George Steinbrenner's most prized eyes for spotting talent across the globe. Steinbrenner recruited Ferreira in 1981 after a team from his baseball school put up a 12-0 lead in an exhibition game against the Yankees. The Yankees owner immediately wanted the man who assembled the talented group of youngsters to be a part of the Yankees organization. A few years later, Ferreira's sharp eye would pay dividends, as he was responsible for helping to lure Bernie Williams to the United States before his 16th birthday in order for the Yankees could sign him. While Ferreira was in the process of bringing Williams to a baseball school in Connecticut, the young Puerto Rican had requested for his cousin to come along. Surely the Yankees with all of their fortunes could find the means to bring one more player with them for an extended look. "I told him sorry, but we couldn't afford it," Ferreira said to the Florida Sun-Sentinel in 1996. "And that's how I missed out on signing Juan Gonzalez." Gonzalez hit 434 home runs in his career, and was ironically the MVP of the American League in 1996 and 1998, the first two years that Williams' Yankees won the World Series. Yankees fans can only imagine how much more potent their lineup would have been if it included Gonzalez's 47 and 45 home runs during those championship years.